Handheld Biometric Terminal from BioLink is a mobile, easy-to-use and high-performance device that provides efficient and reliable method of identity management across high-volume civil identification projects. 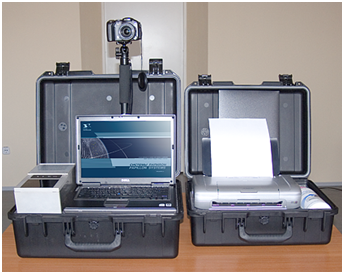 The Mobile Biometric Kit is a rugged, easy-to-use and configure, portable biometric system for voters’ enrollment and identification at the polling centers. Based on biometric fingerprint technology or other optional types of biometrics such as face, IRIS, voice etc., Mobile Biometric Kit provides state-of-art functionality for reliable identification of millions of people.